ow's a great time to seek out an XKR, let's tell you why… Enough were made (9746) to ensure there’s still a decent supply of likely cars out there. Also, they only went out of production in 2005, so there's every chance you can still find that holy grail low mileage, one-owner example. Added to all of this is the knowledge that the X100 has largely escaped the unreliability issues that plagued some earlier Jaguar models and you really are onto a winner. 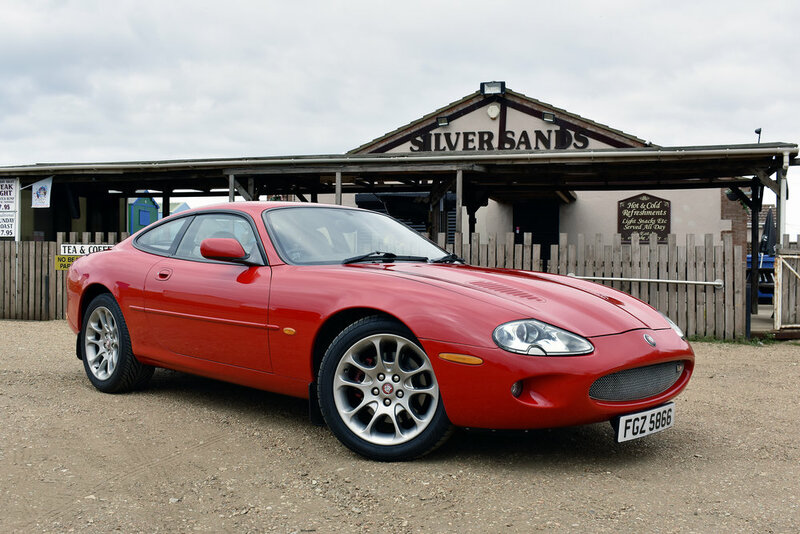 This launch year, Bordeaux Red XKR is currently for sale at Kim Cairns Classics. With just 69,000 miles from new and an almost complete Jaguar dealer service history, it looked truly worthy of a closer inspection. A glance through the bulging folder of history reveals extensive work carried out on the air-conditioning back in 2013 and we're pleased to confirm that it's still working. The bodywork is in excellent condition having never been touched up or corrected. The car has been kept garaged all its life and it shows. Previous owners have kept hold of the original pre-delivery inspection documents and all the brochures and manuals. In short, it's clear that this Jaguar has led a charmed existence to date. On the move it shows its lack of miles travelled and complete and thorough previous care. There's no trace of knocking or clonking from the driveline and the engine pulls vigorously right across the rev range. In fact, as the needle on the right sweeps through the top third of its travel, the noise and forward progress shifts into manic mode. For a GT that weighs the same as an original Range Rover this XKR certainly doesn't hang about. After a spirited drive, we're left in little doubt that this Jaguar can still achieve the 60mph sprint in a shade over five seconds. Interior opulence is the name of the game with this XKR. The leather is near pristine and the wood veneer has survived without the usual cracking or discolouration. Even the wheel and door handles are free of the usual signs of wear. In essence, this XKR makes for an extremely tempting GT. Its history file is excellent, showing years of fastidious care and preventative maintenance, plus backing up the far lower than average mileage. Performance is still strong even by modern standards and the styling looks as sharp now as it ever did. This one is well worth a look. 1996: Jaguar finally replaces the old XJS with the new XK8. 1998: A supercharged version of the AJ-V8 engine is fitted to the subtly altered X100 body, creating the 370bhp XKR. 2001: XKR Silverstone limited edition gets revised suspension and braking all to celebrate Jaguar's return to Formula One. 2003: The AJ-V8 gets several revisions including metal timing gear and a displacement increase to 4.2-litres. The XKR now makes a very healthy 400bhp. Six-speed ZF automatic 'box replaces the five-speed unit fitted since launch. 2006: Last year of X100 run before alloy X150 arrives in '07.